Is it Good? Daredevil #1 Review – AiPT! Like a whole bunch of recent titles, Mark Waid’s beloved Daredevil series was subject to the “All-New Marvel NOW!” treatment. This means it was arbitrarily cancelled a few weeks ago only to be started up with a juicy #1 on the cover this week. I have heard incredibly high praise for the original run, despite my not actually reading the whole thing. Let’s see how this reboot welcomes new readers into the fold. But more importantly, let’s find out, is it good? There were several things that I wanted from this opening issue, several things that, based on what I had heard about the previous forty some issues, I near expected. First and foremost, I wanted Daredevil. 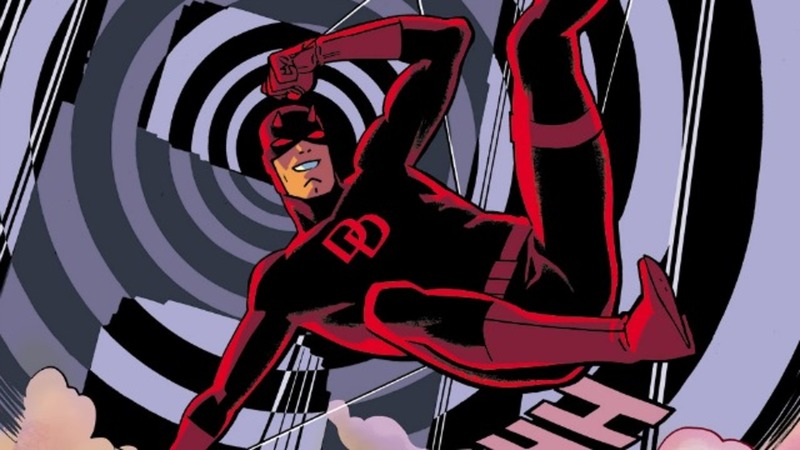 Not some other characters that have met Daredevil, not something all about Daredevil’s past, but rather a story about him as a crime fighter, both in the office and on the streets. I wanted the illustrated radar sense and realistic narration that everyone says is so revolutionary. I wanted real peril and crazy stunts that are so far from my life that I can’t even see them from here. It’s fortunate that this book satisfied my hunger for all of those elements and then some. After the routine introduction to the character and the traditional telling of Daredevil’s backstory we get to see Matt as the superhero we imagine, in his natural habitat, fighting crime in San Francisco. His first case is rather simple: a young girl is kidnapped, her mom is worried. Using his enhanced senses and honed detective skills, he is able to find out who captured the girl where and then proceeds to scoop her up himself. As he is evading the girl’s captors we get to see how he operates, from his radar sense (as expected) to his communication with his partner Kristen. Everything here feels right. His narration is perfect, the way he solves problems is realistic and intelligent. There is a strong female supporting cast member whose help is crucial to Matt’s success as Daredevil and the whole sequence just reads like something I never want to end. Chris Samnee brings a charm and light to this book that could only be described as fun. From the bright, twisting cover to dark, obscurely lit rooms, Samnee has the right feel for the character. For a story that had potential to become quite serious, the art is rather whimsical which creates a sense of adventure. This series isn’t going to be gritty, but that doesn’t take away from the feeling of peril at all. In fact, because the art is so illuminated, we can better take in each stunt or punch, making the action much more readable. Hell yeah! I’m definitely on board for this run, even though I missed the last one, and recommend you come aboard as well. Also, I might have scored this issue high just for the horns on the second “D” in the logo. That’s a great little touch.